Four emerging professionals needed to advance Chesapeake Bay’s rapidly growing oyster aquaculture industry received certificates of completion during a reception at the Virginia Institute of Marine Science last week. 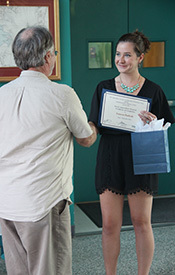 The graduates were interns in the Oyster Aquaculture Training Program at VIMS. Created in 2009 by Professor Stan Allen, Director of VIMS’ Aquaculture Genetics & Breeding Technology Center (ABC), the six-month program is designed to help meet the increased demand for experienced and technical workers that rose with the spread of local oyster hatcheries and farms. This year’s graduates were Kasey Bond of Bedford; Scott Dinning of Richmond; Jared Lawson of Floyd; and Lauren Pudvah of Beverly, Massachusetts. “The program gives the interns the skills needed to perform tasks in both oyster hatchery and field operations,” says Allen. “What’s more, each of the interns provides seasonal help that we’ve come to rely on during our busiest time of year." Pudvah says it’s important for VIMS to offer this program because the aquaculture industry is booming and trained workers are needed to continue its progress. Having recently worked at a hatchery for soft-shell clams, Pudvah came to VIMS to expand her hatchery knowledge and experience. 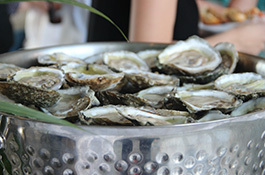 Like Pudvah, Bond says an increasing demand for oysters makes skilled employees an imperative part of the equation for accelerating and improving the growing industry. Dinning—who is currently finishing up his undergraduate degree at Virginia Commonwealth University and plans to enter the oyster aquaculture field immediately after graduating—says the entire program was fantastic, but that he most enjoyed his time in the algae room. During the ceremony, Allen took a moment to recognize each of the interns for their accomplishments, and to bid them farewell as they embark on their futures in oyster aquaculture. Funding for the Oyster Aquaculture Training program was made as an anonymous private donation to the Virginia Institute of Marine Science Foundation, a nonprofit 501 (c) (3) organization that supports the education and research missions of VIMS.